There has been a considerable effort to move France towards full membership in the SKA. During 2014, a major review was undertaken by the French national science agency (CNRS/INSU) to define the priorities for astronomy research over the next 5 years and beyond. This long term prospective included a group on future ground based instrumentation and another on priorities for Research and Development: two scientists involved in SKA were members of these key groups. Over the course of the year, French astronomers were canvassed for their opinions and individual laboratories provided input regarding their research priorities. The working groups met on a regular basis, and ultimately submitted documents for review during a conference held in Giens in October 2014. As a result, the SKA was clearly identified as a major priority for astronomy in France with a recommendation that France should join the SKA Organisation as a full member. The next formal step is the ongoing revision of the National roadmap of large research infrastructures, conducted by the Ministry of Higher Education and Research. We are hopeful that this recommendation will lead to French membership in SKA, despite the financial obstacles related to funding other major projects at the same time. France has been involved in SKA for the past 20 years or so, and particularly since 2005 when France joined the EC funded SKADS programme with major contributions to science simulations and R&D, especially towards the Mid Frequency Aperture Array (MFAA) with the EMBRACE demonstrator operational at Nançay. The Nançay radio observatory and the Laboratoire d’astrophysique de Bordeaux are major partners in the AAMID Consortium which is designing the MFAA for the SKA in Phase 2. The French groups are working towards further integration of analogue circuits, including a beamformer chip based on time delay which will provide large bandwidth. The group is also providing amplifiers adapted to the Octogonal Ring Array antennas developed in Manchester. EMBRACE continues to be operated at Nançay, proving that MFAA technology is robust, reliable, and making astronomical observations daily. In addition to work on MFAA, the Bordeaux group is involved in the Wide Band Single Pixel Feed (WBSPF) consortium with the development of large band Analogue-to-Digital Converters. After the recent rebaselining exercise, the SKAO decided to include band 5 (4.6 to 13.8 GHz) for SKA Phase 1, and Bordeaux is working with the Dish consortium on the design related to signal conditioning, ADC and distribution of digital signals on optical fibres. 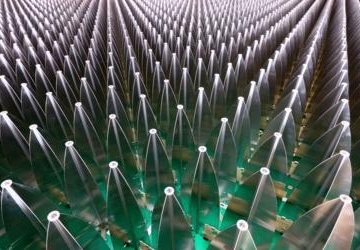 There is also a strong interest in the low frequencies in France, and the NenuFAR project is moving forward. 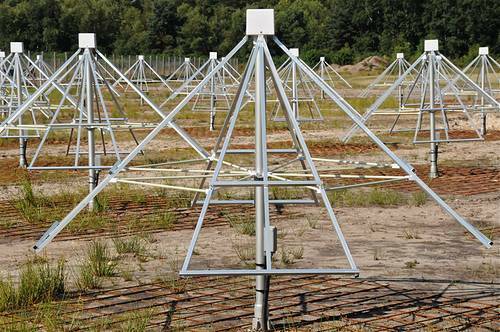 NenuFAR is an extension of the standard international LOFAR station at Nançay which will add 96 mini-arrays of 19 high gain antennas to it. By the end of this year, 22 of the 96 mini-arrays will be installed, with the rest to follow during 2016/17 as funding permits. Meanwhile, in September 2014, the NenuFAR project was granted the status of “SKA Pathfinder” and lessons-learned from the NenuFAR installation, characterisation and operation, will be fed into the AADC consortium designing the Low Frequency Aperture Array for SKA. Beginning in September 2015, the Observatoire de la Côte d’Azur in Nice will be a full partner in the LFAA SKA Work Package. The Nice Observatory is contributing to SKA-low with the development of 3D deconvolution algorithms for interferometric data. This is in addition to their continuing work in the Science Data Processing (SDP) consortium for the development and testing of algorithms for image reconstruction. In addition to the technical development work in France, French astronomers are active in all the Science Working Groups, including 11 core members, and another 13 associate members. France has been involved in SKA since the earliest discussions, and especially since the EC funded SKADS project with contributions to the SKADS Simulated Skies (still highly cited) as well as with work on simulations of the Epoch of Reionisation, and a number of pilot observing programs on various facilities such as the Nançay Radio Telescope, and future surveys planned with SKA pathfinders MeerKAT and ASKAP. With all the technical and scientific involvement in SKA from the French astronomy community, we certainly feel strongly that France should be a full member of the SKA Organisation. We are working hard to make this happen.